In Bowling Alone (2000), Robert Putnam claimed that civic participation in the U.S. has been declining. One metric he offered in his book was the decline in the number of volunteers in civic organizations such as religious groups, labor unions, Parent-Teacher Associations, or fraternity organizations. Not everyone fully agrees with Putnam’s arguments: some suggested that perhaps civic participation now takes different forms—not through PTAs, but perhaps through the Little League or soccer clubs, animal rescue operations, or other forms of volunteerism that did not exist before. More people volunteer in the District, but each do so for fewer hours. In 2013, an estimated 150,000 District residents (or about 31 percent of District’s adult population) reported volunteering for a cause. 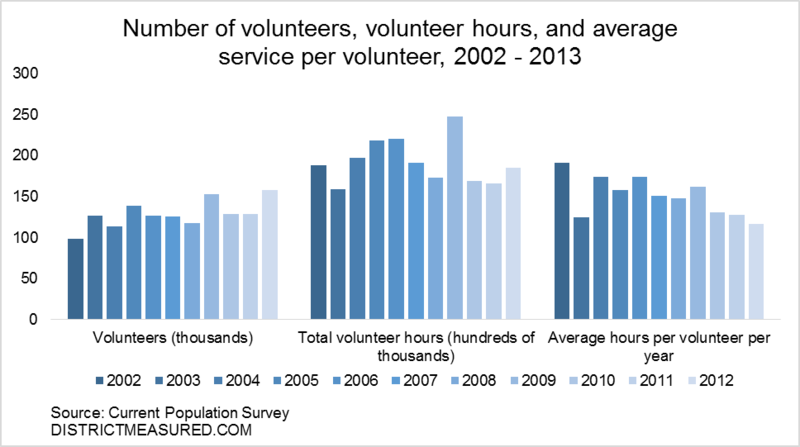 More people volunteered in 2013 compared to 2002 (up from 98,000), but each did so for fewer hours. District residents who volunteer have been spending on average 130 hours each year on these activities—equivalent of three and a quarter weeks of full time work–down from approximately 163 hours or four weeks of full time work averaged between 2002 and 2005. As a result, total volunteer hours increased by only 10 percent (from 18.8 million hours to 20.7 million hours) while the number of volunteers increased by 50 percent. Women’s contribution to volunteer activities is declining in the District. In 2002, women collectively contributed 13.3 million hours of volunteer work; in 2013, their total contribution had declined to 12.4 million hours. Women volunteer more frequently than men do, and generally put in more hours. In 2013, women provided approximately 60 percent of all volunteer hours in the District, providing, on average 21 hours more of volunteer hours compared to the District’s men who volunteer. In 2002, women provided 71 percent of all volunteer hours and provided, on average 88 hours more of service compared to the men. During the same period, the share of women’s contribution to total hours volunteered fluctuated between 56 percent and 58 percent across the entire nation. 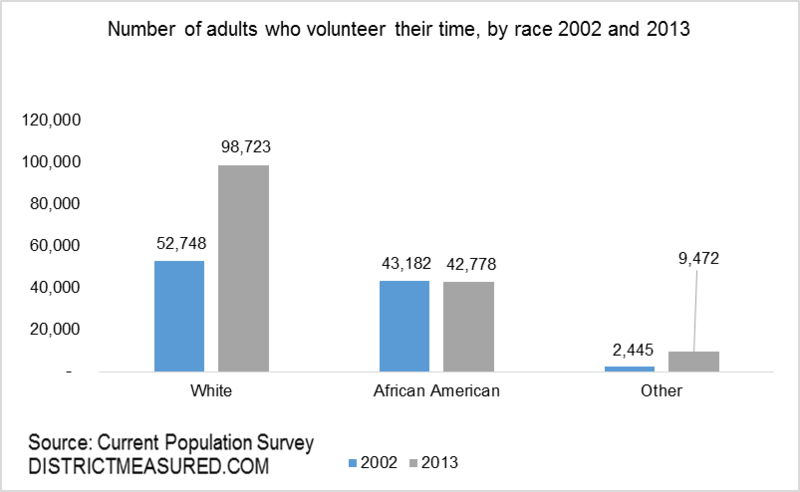 The growth in the number volunteers between 2002 and 2013 entirely came from the increasing white population, but the growth in the total number of volunteer hours came entirely from the African American community. African American residents of the District are less likely to volunteer; however, when they do, they volunteer twice the time at 226 hours per year (or over 5.5 full weeks of their time) compared to their white counterparts. 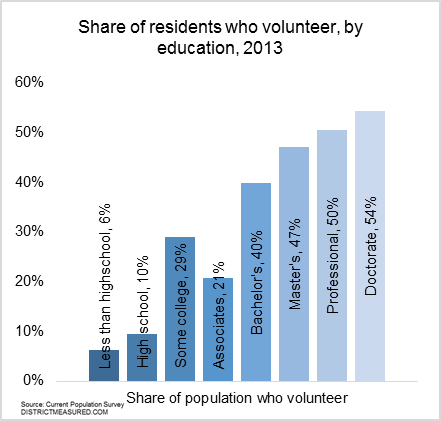 District residents with higher levels of education are more likely to volunteer, but they do so for fewer hours. Half the residents with a professional and doctoral degree volunteer for some cause, compared to 10 percent of the population with a high school degree, but they only commit about 78 hours per year—this is one third of the hours committed by volunteering adults (the data track those 15 and older) who have a high school degree only. Types of organizations that attract volunteers changed significantly. Looking at the type of organizations people volunteer for (here we are tracking organizations people report as their top three volunteering outlets), we see some interesting stories. The table below tracks both how these organizations are growing (second column) and how the District’s volunteer population is shifting across them (third column). This last metric shows us what types of organizations are gaining relative ground, which ones are stable, and which ones are on the demise. Kids are the big winners. Between 2003 and 2013, volunteer organizations for kids’ sports and rec groups (the Little League, soccer groups, chess clubs etc.) have added 19,320 volunteers going up from 25,000 volunteers to 44,400 (or 77 percent growth over its base). This was already big in 2003, but became even bigger, with 20 percent of the volunteers engaged in these organizations in 2013 compared to 17 percent in 2003. Volunteer definitions are changing. In 2003, only 3,000 adults, or two percent of District’s volunteer population, reported volunteering for an organization that did not fit under any of the traditional types of organizations. This number grew by 14,000 and now stands at 8 percent. What types of organizations might these be? Perhaps they are technology focused organizations (Engineers Without Borders, Wikipedia, the Guttenberg Project, or open source foundations such as Yorba (though they have been denied nonprofit status by the IRS). Environmentalism is on the rise; immigrant and refugee assistance is up and coming. Between 2003 and 2013, the number of DC residents who identify environmental or animal care organizations as their volunteering outlet has increased by 5,800; or by 120 percent. They still constitute a small, but rapidly growing, share of volunteers. Volunteerism for immigrant and refugee assistance groups did not even exist in 2003 (a surprise, given the international nature of our city); now they attract 1,332 residents. Public safety is dead. Not a single resident reported volunteering for a public safety organization in 2013. Their numbers were already low in 2003, but now we see that volunteering for the fire department or neighborhood watches are things of the past. We have completely professionalized this area. Religious organizations and social and community service groups are still big and growing, but not as fast. Social and community service groups added nearly 9,900 volunteers, but their growth lagged, at 28 percent, behind the city average of 50 percent. These type of organizations now attract 20 percent of all volunteer adults, as opposed to 23 percent in 2003. Here is what the newcomers to the District (read, millennials) do not care for: Political parties and advocacy organizations, cultural and arts organizations, sports and hobby groups, labor unions, professional organizations and health research and education groups. These kinds of organizations either lost volunteers or barely added any new ones. Counseling, music or artistic performances, and tutoring and teaching are on the demise. Counseling lost half of its volunteer base, music or artistic performances lost 40 percent. With counseling, it might be that people are reluctant to offer this service without proper credentials. Tutoring and teaching is still a large activity (28,500 residents report it as their main activity in 2013) but this base did not grow at all from 2005. Coaching sports increased its base by 50 percent, going from 5,100 adults reporting this as their main activity to 7,675. This is just another measure of the growing importance of kids. The real surprise here is usher and greet activities. This group added 7,753 new volunteers since 2013. Given these activities generally attract older people–the median age among these volunteers is around 50, compared to 38 for all those who volunteer–it is odd to see such growth in a city that is flooded by young people. However, as we have noted elsewhere, the senior population in the District has been growing, both in numbers and riches, perhaps increased volunteerism among this group should be expected. What is the takeaway from all of these? First, volunteerism is still growing in the District, but our time commitment to volunteer activities is on the decline. Second we are more focused on our children, and to some extent, on our ideals. Work related volunteerism is on the demise; so is volunteerism in health and social services sectors, perhaps because of credentialing requirements. Finally, an increasing share of volunteers work for organizations that are not in the traditional definition of volunteering outlets. It would be interesting to find out what they do. Several months ago we reported that D.C.’s population boom is slowing. The city’s been growing for almost a decade, with the biggest population increases happening post-recession, starting in 2009. Growth peaked in 2011 when we added more than 15,000 residents, and it has slowed a bit each year since. In 2014 we added a little under 10,000 residents. The result is that while D.C.’s growth still outpaces that of the nation and the average large city, it’s no longer one of the fastest growing cities. In 2011 D.C. had the fifth-highest growth among the nation’s fifty largest cities. In 2014 it ranked nineteenth. As we noted in our previous post, the decline is mostly due to fewer people moving to D.C. from other parts of the country. As in previous years, the cities with the largest annual growth in 2014 were in the south and west: Austin, Denver, Fort Worth, Seattle, and Miami comprise the top five. Las Vegas, Phoenix, and Kansas City made huge leaps in the rankings between 2011 and 2014. Interestingly, many of the cities that dropped the most in the rankings are those known for their high cost of living, like New York, San Jose, Boston, and, of course, D.C. In March of 2015, for the first time since September 2011, the number of federal civilian employees working in the District showed an increase. If this is the end of a three year contraction in the federal employment, it is a modest one: the net increase was only 1,100 or 0.6 percent over the first quarter of 2014. Looking back, fluctuations in federal jobs have been associated with major developments in the District’s economy. For example, federal cutbacks contributed to the conditions surrounding the establishment of the DC Control Board in 1995. More federal jobs helped the city cope with the aftermath of the 9/11 attacks and the Great Recession that began at the end of 2007. The recent loss of federal jobs appears, however, to have had only a moderate impact on the District’s economy, as total employment in DC rose by 33,634 over that period. First, District’s private sector is growing in strength and diversity. Over the last 25 years, there has been a shift in DC’s labor market toward the private sector, a shift stronger in jobs than in earnings. From 1990 to 2015, DC lost 22,165 federal jobs (a 10.1 percent decline) while the private sector added 115,000 (a 28.3 percent gain). Adjusted for inflation, over that time federal wages and salaries grew 31.6 percent while the private sector wage and salaries grew 70.6percent, more than twice as fast. Looking back even further, to the period of federal cutbacks in the 1990s, we see an even more dramatic shift: From the second quarter of 1993 to the second quarter of 1999, DC lost 50,134 federal jobs, but the private sector gains during the same period offset only a third of this loss with a gain of 18,000 jobs. From 2011.3 to 2014.4, by contrast, the 49,200 gain in private sector jobs was about 3 times greater than the 16,166 federal jobs that were lost. About one-third of the new private sector jobs occurred in education, but increases occurred in a number of other sectors as well. One thing to watch out is the difference in federal and private sector wages. Most private sector jobs that replace federal jobs pay much less, and if this trend continues, it will have implications on the type of workers and residents the District attracts. Second, forces currently driving DC’s economy are less dependent on net growth of jobs located in DC. Starting in 2006, the year before the onset of the Great Recession, DC’s population started to increase, and from 2009 to 2014 it increased by 66,665 (11.3 percent). This increased attraction of the District of Columbia as a place to live has affected the economy in a number of ways, and the one most relevant here is that resident employment has been increasing more rapidly than the number of jobs located in DC. This can occur for several reasons: more residents working outside of DC, more residents holding higher paying jobs, residents taking jobs of commuters who retire or otherwise leave, or residents working for themselves or as independent contractors. Third, federal contracting possibly fuels some of the strength in the District’s private sector. 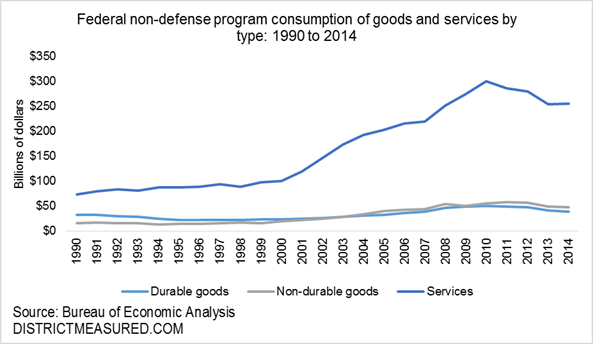 In recent years, federal government expenditures for non-defense programs have shifted toward greater reliance on purchases of goods and services rather than compensation of employees. The change was particularly great starting around 2000; from 2000 to 2014, federal purchases went up 153 percent, compensation by 91 percent. The increase in purchases of services was particularly strong, tripling between 2000 and 2010 before tailing off a bit. Data on such purchases from DC’s private sector are not available, but a pattern here similar to the national one would help to explain some of the rapid growth of professional and technical services in DC. Agencies are more likely to contract with businesses or professionals in close proximity. Indeed, employment in professional and technical services increased 54 from the first quarter of 2000 to the last quarter of 2014—this is almost double the 28.4 percent pace for employment growth in all of DC’s private sector. The recent decline in federal employment may not have upended the District’s economy, but the federal sector remains a vital component of the District’s economy. Federal spending accounts for 26.1 percent of all jobs in DC, 31.1 percent of all wages, and is a source of contracts for DC’s private sector. What happens with federal spending will therefore have considerable influence on the future growth in DC’s economy. If federal spending remains flat or declines, the rate of growth in employment and earnings generated by the District’s economy will depend on how the private sector performs. DC growth rates then could approach or surpass the US only if DC’s private sector outperforms the nation as a whole. For most of the past 3 1/2 years, DC’s private sector employment actually grew faster than the US average, but it has been below it for the past three quarters. 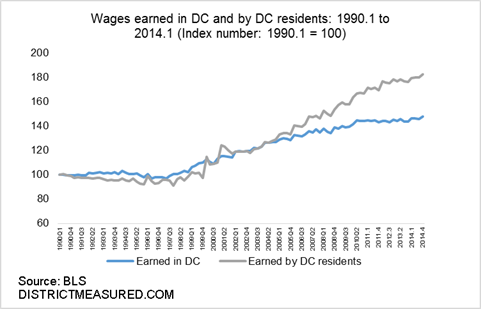 Wage and salary growth in DC has been about the same as the US average. 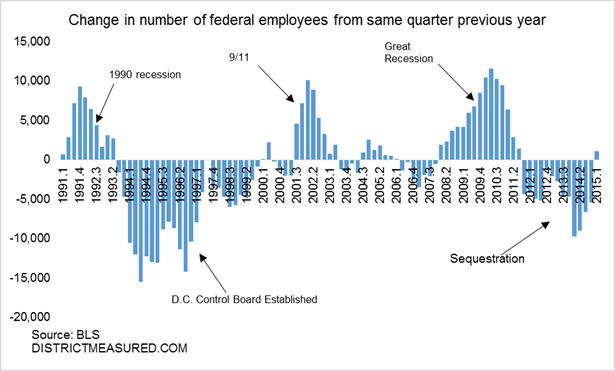 Increases in federal employment and earnings were important for DC’s economy in recovering from the recession in 1990, the 9/11 attacks and recession in 2001, and, of course, the Great Recession from 2007 to 2011.3. Thus, the federal government’s stabilizing role will likely remain important for the District’s economy in the coming years. You can find more on this topic in our most recent Monthly Economic and Revenue trends report. What exactly is this data? Employment data is from Bureau of Labor Statistics, and wage data is from the Bureau of Economic Analysis. Totals for jobs and wages include state and local government. DC resident wages and salaries estimated by the Office of Revenue Analysis, assuming wage and salary supplements are the same % for DC resident wages as for wages earned in DC. Detail may not add due to rounding. Government consumption data is from NIPA Table 3.10.5. Government Consumption Expenditures and General Government Gross, also from the Bureau of Economic Analysis, last revised on April 29, 2015. Innovation in the District: Why is DC’s digital divide larger compared to other cities? What factors account for the divide? In a previous post we examined patent data as a measure of innovation that occurs in the District and in other major cities. Using this measure, we observed that while the District was among the leading tech centers in the nation, it still lagged behind some of the top tier cities, particularly those on the West Coast. The data also suggests that a strong eco-system supporting innovation was likely to be an important factor in explaining where innovation occurs. Using U.S. Census data we examine the digital divide that exists among households of different income levels and whether income and other demographics factors such as age and race explain differences in internet availability across major cities. 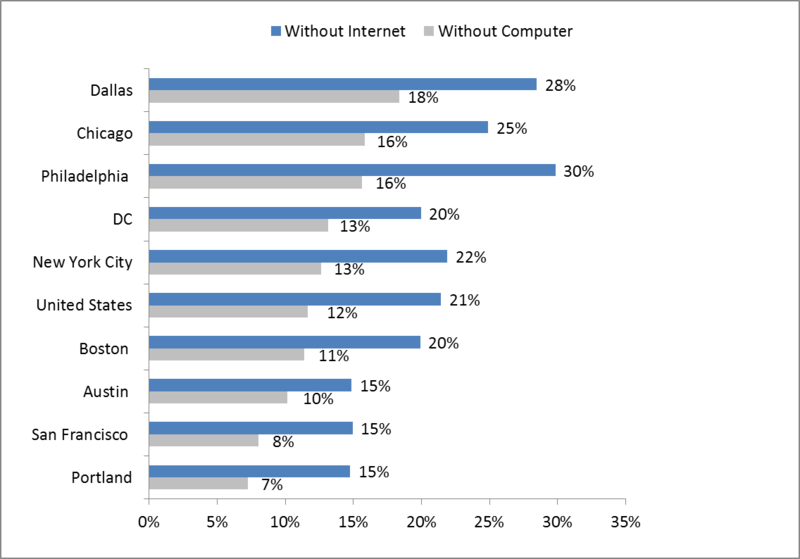 Overall computer and internet availability for District households was comparable to the national average, although DC lagged behind several competitor cities such as San Francisco, Austin and Portland. The data shown above does not reflect the large differences in internet availability among households at different income levels. Other research has highlighted the digital divide that exists between low income households and high income households. Here we compare DC households to households in other competitive tech cities with the same income. 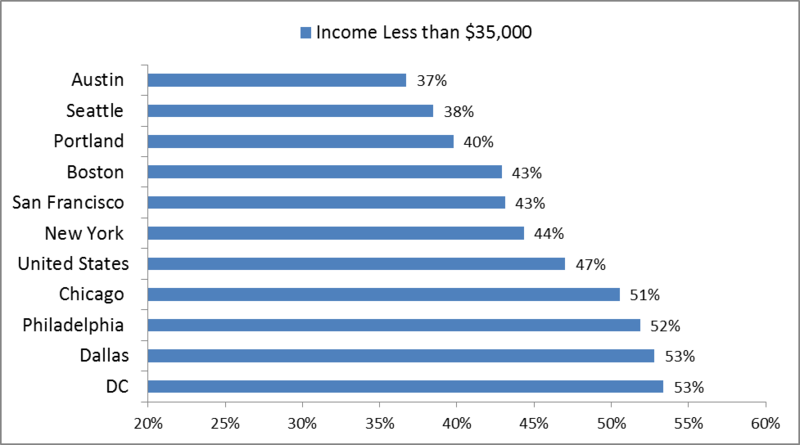 The majority (53%) of households in the District with incomes below $35,000 lack internet access at home. The District lagged behind the national average and most other major cities by this measure. In Austin and Seattle about one-third of low income households lacked internet access, a far lower share than the District. Even in expensive housing markets such as New York and San Francisco, internet availability among low income households was higher compared to DC. While internet access increased significantly for households between $35,000 and $75,000, almost 30 percent of households in DC in this income range still lacked internet access. For the West Coast cities and Austin, the percentage of households lacking internet access was about half as a high as in the District. 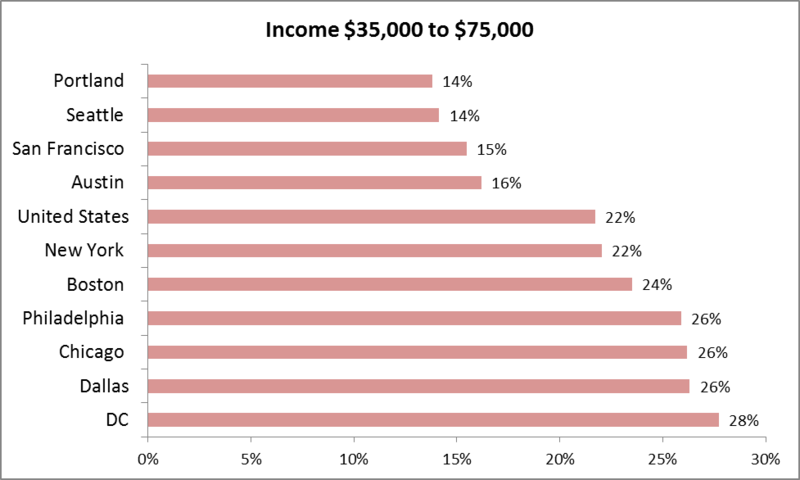 For households with incomes greater than $75,000 (shown below) the situation is very different. Nationwide only 8 percent of households with incomes greater than $75,000 lacked internet access at home. For the District the percentage was 7%. 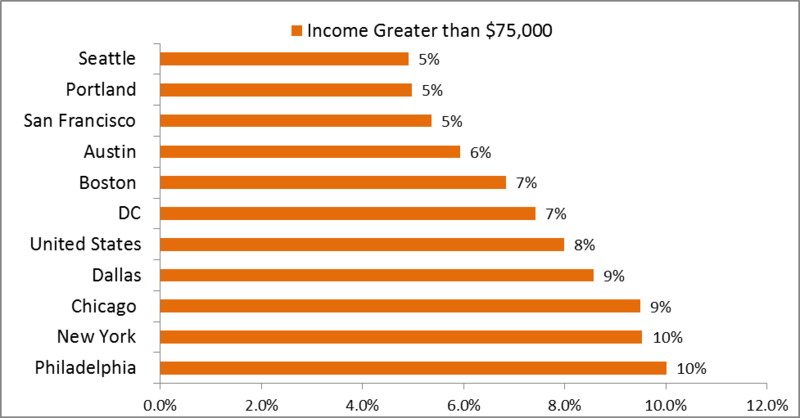 There was far less variation among major cities for this income group, the lowest percentage was on the West Coast, the highest was for New York City and Philadelphia. While internet access and income are strongly correlated, research also suggests that other demographic factors such as age and race also account for differences in internet use. A Pew Study found that seniors and minorities were less likely to use the internet. We looked to see whether age and race could account for the large difference in internet access between DC and San Francisco. We found that San Francisco had a much higher concentration of low income households among seniors compared to DC and that age or income alone did not account for the lower internet availability in DC. A larger presence of minorities explained some, but not all, of the gap between DC and San Francisco, after controlling for income and age. Other non-demographic factors, including innovative private and not for profit outreach efforts targeted at low income households, cultural factors and other social factors are also likely to help explain the digital divide. Data are from the U.S. Census Bureau: 2013 American Community Survey. Data are based on a sample and are subject to sampling variability. An abstract of the study “The impact of computer use at home on students’ Internet skills” by Hans Kuhlemeier and Bas Hemker can be found by clicking here. 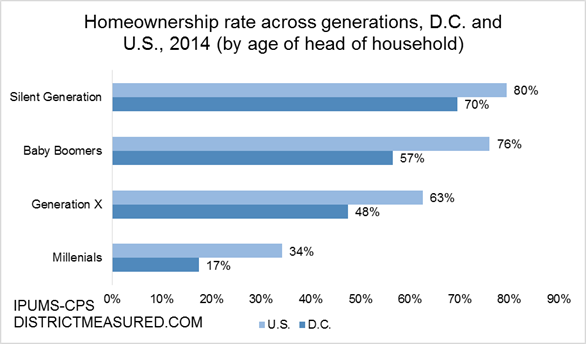 Compared to the rest of the nation, homeownership is lower across all age groups in the District. The largest differences are for millennials and while the gap narrows by age, it never fully closes. Millennial heads of households are nearly twice more likely to own the homes they live in across the entire nation compared to the District. There could be many reasons for this: high prices in the District, or delayed family formation for the millennials. We already know that the prices in the District are high, and there is some evidence that millennials are delaying forming households. 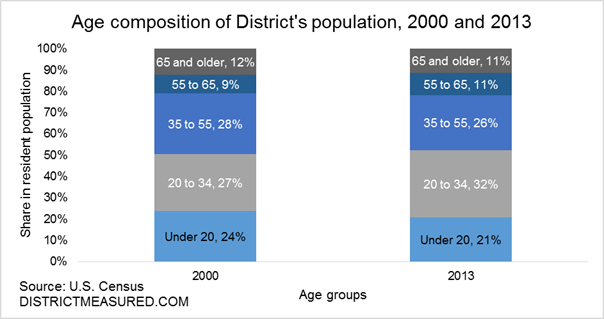 Here is how we see it: The recent population boom in the District can be largely attributed to inflow of young people. Of the nearly 75,000 net increase in resident population between 2000 and 2013 (the latest year for which age breakdown of the population is available), 51,000 come from those between the ages of 20 and 34 (comparable to today’s millennials who were between the ages of 18 and 34 in 2014). This group now constitutes 32 percent of the total population compared to 27 percent in 2000. However, millennials of 2014 are not forming households as fast as their comparable age group did back in 2000 (today’s Gen-Xers). 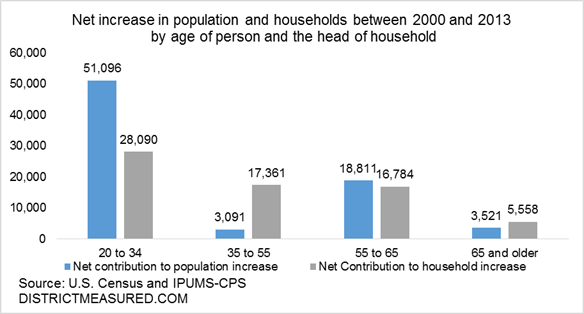 Those under the age of 34 added more households to the District compared to older groups between 2000 and 2013, but each net increase in resident population in this age group resulted in a net increase of 0.5 new households headed by a similarly aged person. In contrast, those between the ages of 35 and 55 added about 3,000 new residents, but more than 17,300 new households. That is an increase of 5.6 households for one new resident from this age group. Homeownership plays a role in this dynamic. 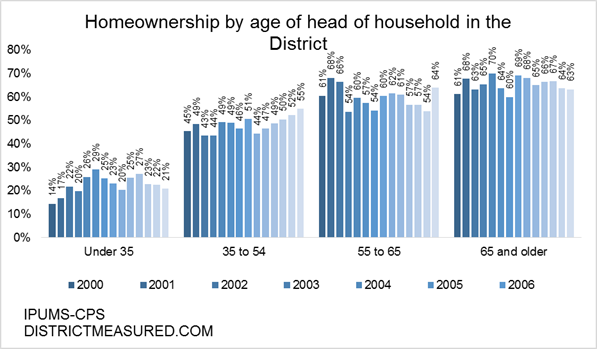 For the young people under the age of 34, homeownership rates increased between 2000 and 2005, and suffered since then, first through the great recession and once again since 2011. This probably has to do with steep increases in home prices beginning early 2000s. In contrast, those between the ages of 35 and 54 defied the Great Recession, increasing their ownership rates by more than 4 percentage points (just as comparison, ownership rates for this age group declined by 6 percentage points since the great recession across the entire nation). This is yet another picture of gentrification. We sometimes think of gentrification as something driven by young people. They move in, drive up rents and force low-income families out. This data suggest, however, that the changing profiles of Gen Xers might be another key driver of socioeconomic changes in the District. The dynamics of population for those between the ages of 35 and 54 suggest a great churn, with a small net increase in population but a large increase in household formation and homeownership, suggesting that the newcomers in this age-group are probably wealthier than those who leave. What exactly is this data? Population data by age groups is from the U.S. Census. Homeownership and income data are extracts from the Current Population Survey data maintained by Miriam King, Steven Ruggles, J. Trent Alexander, Sarah Flood, Katie Genadek, Matthew B. Schroeder, Brandon Trampe, and Rebecca Vick. Integrated Public Use Microdata Series, Current Population Survey: Version 3.0. [Machine-readable database]. Minneapolis: University of Minnesota, 2010. The post uses the generation definitions from Pew Research Center. Some D.C. parents say weak middle schools cause students to leave DCPS for charters, or leave the school system altogether. The Washington Post has called this “sixth-grade brain drain.” So just how bad is the loss of students as they approach their middle school years? This school year there were 4,515 eighth-graders in public schools across the city (in both charters and DCPS). This group started out with 5,404 students in kindergarten in the 2006-2007 school year. That means the school system lost 889 students, or more than 16% of those who started kindergarten in 2006-2007. This is the net loss of students, meaning 889 more students left the system than entered it after their kindergarten year. Some of these students left the city and others switched to private schools. Enrollment data show this loss of students is driven by children leaving DCPS, especially between grades 5 and 6. The graphs above show that DCPS students are both switching to charters and leaving the system. How has this changed over time? For current sixth-graders, who entered kindergarten in 2008-2009, two years after the first cohort of students we examined, there was a similar drop in enrollment between kindergarten and fourth grade. 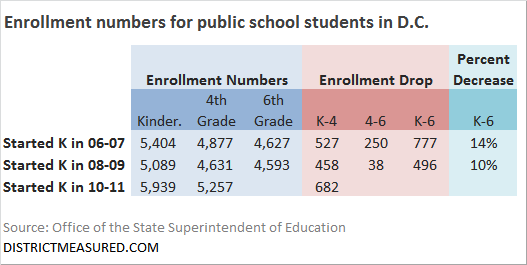 But, unlike the previous cohort, the enrollment numbers flattened out after fourth grade. 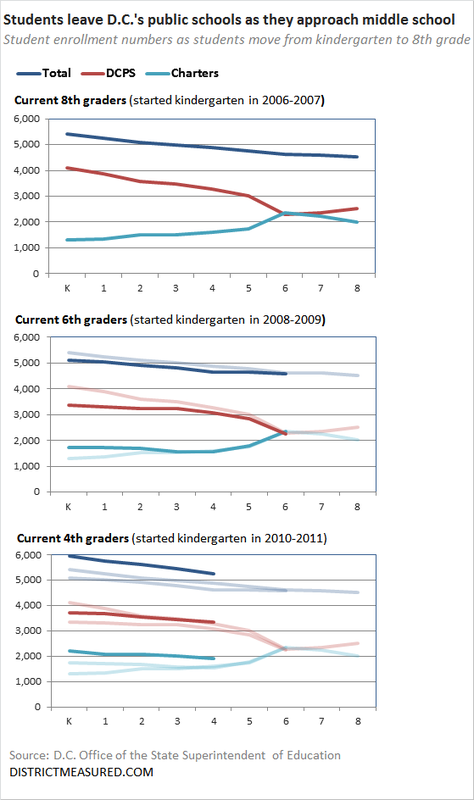 As a result, the decline in enrollment from kindergarten through sixth grade was smaller for those who entered kindergarten in 2008-2009 as opposed to 2006-2007 (a decline of 777 vs. 496, respectively). Let’s look forward two more years to students who entered kindergarten in 2010-2011. These students are currently fourth-graders. The first thing we notice is this group of kindergarteners is bigger than the other two cohorts we looked at – it had over 5,900 students, hundreds more than the other two years. This is probably due to a surge in enrollment in the pre-K grades starting in 2008. Even though this cohort started off with strong numbers, the drop in enrollment between K and 4 for this group was slightly higher than that of the earlier cohorts. Still, it’s on track to have a higher middle school enrollment since it started with a larger kindergarten class. One last note: we know that enrollment in D.C.’s public schools spikes in ninth grade. We believe this is mostly due to the large number of students who repeat ninth grade. The Washington Post reported that 40 percent of first-time ninth-graders in DCPS are held back. What exactly is this data? These are the audited enrollment numbers from the Office of the State Superintendent of Education for school years 2006-2007 through 2014-2015. You can find the numbers here. Which Capital Bikeshare stations see the most traffic? Since its launch in 2010, the Capital Bikeshare program has witnessed tremendous growth in ridership. 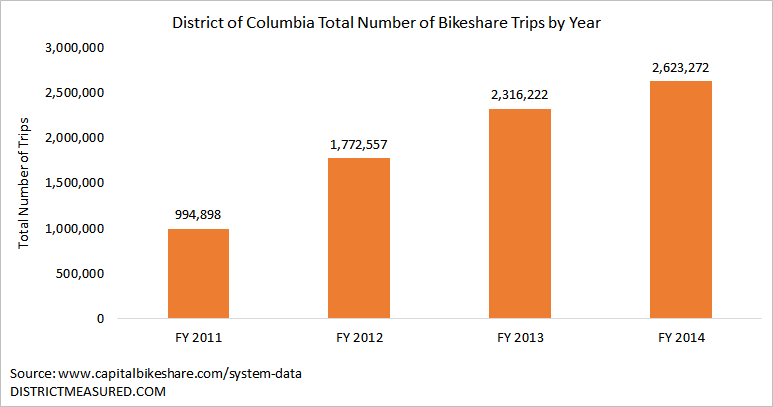 From 2011 to 2014, the number of Bikeshare trips that began or ended in the District of Columbia grew 2.6-fold. This remarkable growth has been fueled by the addition of new Bikeshare stations throughout the region and by the attractiveness of the program as an alternative mode of transportation. 54 percent used the bikes to exercise. However, when weighed by the frequency of trips, the most common use of Bikeshare is for going to work. Survey respondents that use Bikeshare to travel to work did so more frequently than for any other purpose. Of these travelers, nearly half use the bike share more than six time per month to travel to work. This left us wondering if Capital Bikeshare trip data for the District of Columbia supports the results of the survey. We analyzed program data since the start of the program and created an interactive map to visualize station traffic and user habits over time. Within the District, the net Bikeshare traffic flows from the NW quadrant to downtown area and to Georgetown. The average District Bikeshare station experiences approximately 1,079 arrivals, 1,081 departures, and 2,159 total trips each month so on average, arrivals and departures even out across the city. There is great variation in trip volume between stations. The location with the highest amount of use, Massachusetts Ave & Dupont Circle NW, averaged 9,751 in monthly trips. In comparison, the location with lowest amount of use, Nannie Helen Burroughs Ave & 49th St NE, averaged only nine trips per month. Station trips fluctuate seasonally due to weather conditions. The use begins to increase in April, peaks in the summer, and declines beginning October. Comparing arrival and departure data by station with the District of Columbia Office of Zoning land use map shows that Bikeshare traffic flows from residential areas to commercial areas. In order to compare stations, we calculated the percentage of total trips that were arrivals and departures for each station. Then we calculated the difference between the arrival rate and the departure rate to see if bikes tend to flow in or out of a station. For example, if 70 percent of all trips logged in a station are arrivals and 30 percent departures, the station’s trip balance would favor arrivals by 40 percent. Since 2011, stations with the highest percentage of arrivals are generally located in areas of the city that are designated as commercial use and are home to offices, restaurants, nightlife, and entertainment. Conversely, stations with the highest percentage of departures are generally located in areas designated for residential use. The most balanced stations – those that essentially have an equal percentage of arrivals and departures – are located in a mix of residential, commercial, federal, and institutional areas. The data we analyzed also captured another Bikeshare phenomenon that has been documented in the past. There is an imbalance between arrivals in departures across the entire system which requires an extensive redistribution program to ensure bike availability. This imbalance is captured in the survey results since 59% of respondents cite access to transportation and the ability to take one-way trips as an important factor in their decision to join the Capital Bikeshare. Bikeshare station location and trip data were derived from the Capital Bikeshare dashboard. Zoning and land use information was gathered from the District of Columbia Office of Planning land use maps. 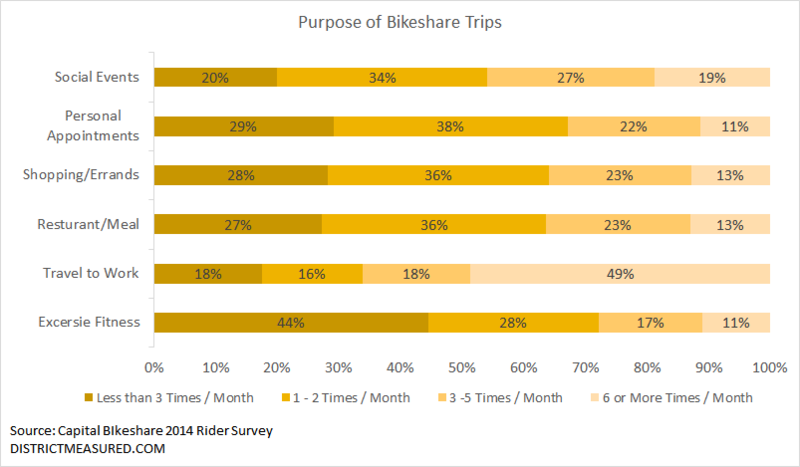 The survey results referenced in the post are included in the 2014 Capital Bikeshare Member Survey Report.